HRIC is shocked by the information that imprisoned Nobel Peace Laureate Liu Xiaobo (刘晓波) is suffering from late-stage liver cancer, and outraged by the fact that it is only at this point that the Chinese authorities have released him on medical parole. We are greatly saddened by the heartbreaking video circulated today of Liu Xia (刘霞), wife of Liu Xiaobo, crying to a friend saying: “they cannot perform surgery, cannot do radiation, cannot do chemotherapy” (不能动手术、不能放疗、不能化疗), referring to Liu’s condition. 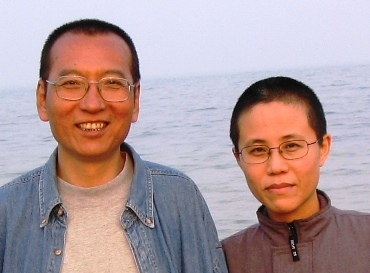 “Releasing” Liu Xiaobo at a point when no treatment seems possible highlights the authorities’ inhumane and blatant disregard for the rights and dignity of Liu and his family. But reportedly the diagnosis of Liu’s condition was made on May 23, just over a month ago. That such an advanced illness only received a diagnosis so recently raises serious concerns about Liu’s treatment in prison. The authorities stated that they have sent a team of eight medical experts to the First Hospital of China Medical University in Shenyang, Liaoning Province, where Liu has been transferred. The Chinese authorities must make a thorough and public accounting of Liu Xiaobo’s condition and the treatment he has received during his more than eight years in prison, and release his full medical records to his family. Liu Xia should be allowed to immediately bring in an independent medical doctor of the family’s choosing, in order to assess and treat her husband. The authorities must also end their restrictions on the rights of Liu’s family to speak publicly and express their concerns. Liu Xiaobo—a prominent Chinese intellectual who received an 11-year prison term on the charge of “inciting subversion of state power” for co-drafting Charter 08, a proposal for political reform—is but the latest example of the Chinese authorities’ ruthless trampling on human rights and punishing speech. He may be only the tip of the iceberg of the number of people suffering abuse and being imprisoned for expressing their views and exercising rights protected by Chinese and international law. HRIC urges relevant international authorities to send representatives to visit Liu Xiaobo in the hospital to assess his situation and ensure that all humane treatment and the wishes of the family are respected. In light of the recent reports of rights defenders and lawyers being forcibly drugged in custody, and then released with signs of physical and psychological abuse, the international community must press for an accounting by the Chinese authorities of the treatment, including appropriate medical care, of detained and imprisoned individuals, including those detained in the 709 crackdown. These individuals are being punished for expressing their views and exercising their fundamental rights, and many are paying with their freedom, health, and even lives. We also urge members of the international community to keep Liu Xiaobo and his family in their thoughts. People gathered in front of Hong Kong’s Court of Final Appeal for a candlelight vigil to demand the release of imprisoned Nobel Peace Laureate Liu Xiaobo, who is suffering from late-stage liver cancer and has been transferred out of prison to a hospital for treatment. AddOil Arts Action to support Liu Xiaobo, Marathon reading of "I have no enemies"
This special CRF issue includes a collection of essays by Liu Xiaobo that the authorities claimed to have constituted evidence of his incitement to subvert state power, official documents, Liu’s final statement at trial, “I have No Enemies,” as well as a chronology of Liu’s activism.